thanks for sharing these photos, they’re so cute especially the teen’s one :)…..i think it’s so pinoy being ma-postura no? ….i mean we can’t just go out wearing our pambahay clothes dba?…..anyways enjoying your posts this week….kudos again on the NR show…. Hi MM, this post does not have anything to do with the (in)famous shirt you wore for NR? Like exorcism & redemption??? MM, you had me laughing again! I can just imagine Sister’s consternation at the introduction. I thought that The Teen’s picture was that of a Little English Miss until I saw the banca in the background and read the rest of your post. She sure did inherit the “postura” gene. hahaha… revenge does happen, eh? and on an international scale at that! and during NY Fashion Week pa! this was a fun read, MM, i kept laughing. super-postura mom and grandma? i can sooo relate. seven hours after delivering my baby the natural way (no anesthesia), my mom tells me to comb my hair, put on makeup and lipstick because “the guests are arriving”. and she gifts me with a nightie and bathrobe set which to this day i call “the for-hospital-visitors’-viewing-set”. hahaha… my grandma on her deathbed would periodically call out for her comb and “pulbos” because she had to be beautiful when she finally met her (long-dead) husband! as to the sibs, MM has indeed come full circle. they will forever be referrred to as siblings of the guy who made and served the best pig…..ever. (so maybe you can ask Kuya to tie your shoes, or Ate to turn off the TV when you fall asleep…heehee…. 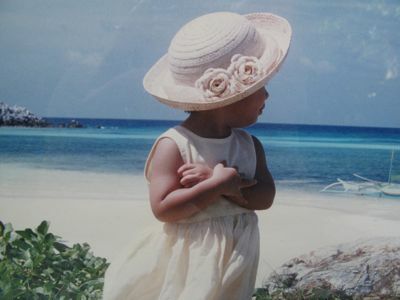 by the way, very nice picture of The Kid there…..early postura training – the hat, the arms folded, the dress, the gaze….precious! mm, your mother looks absolutely fabulous! 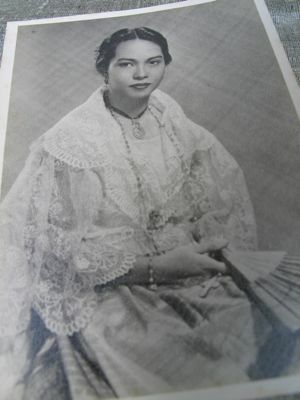 the whole photograph is filipiniana to the core – banig background, that classic hairstyle, classic bling and the pina baro’t saya. i want to have my posterity/postura photo taken like that too – kaya lang where to get those items. as long as the pig “tastes like candy” and the philippines (cebu) is the #1 roasted pig in the world, i would not mind being a sibling of the pig man, so i hope mm’s sisters and brothers are fine, and not offended. Thank you for sharing your valuable memorabilia! Your Mother had a splendor beauty and knew how to carry her clothes and jewelries well! Look how stunning she was in her Maria Clara outfit with matching jewelries thereto. The jewelries are my ultimate desire to own but I could not find one around especially the cameo which I believe is made out of coral. With so many laboratory stones they create now, I cannot tell the difference. The tamburing bracelet and neck chain I believe they do not make them anymore. You are quite a head turner even at a young age. The Teen definitely is a carrier of the postura genes. To me postura is an inborn (genetically I suppose) and ingrained trait not acquired or developed later on in life regardless how much fortune you amassed. There are people paying seven figures for their wardrobe and they still look cheesy like they picked up their clothes from a thrift shop. I understand the feeling being at the end of the totem pole. I grew up handed down from older sisters – school uniforms, clothes, shoes, etc. My Mother was way ahead of her time and practiced and preached recycling in our household. wow Ganda tsaka yung Haba ng Tamburin. Was she wearing a golden comb too? heheheh kasi mga matatanda mga isang set ng mga alahas nyan….antigo pa..
am in the office and laughing again while reading your blog, my staff calls out and says ” you’re reading that pig blog again right?”… branded ka na talaga.. Your mom is so beautiful, she is wearing my idea of a real filipino dress complete with the tambourine and hairdo. Thanks for sharing the photos and congratulations on your happy revenge on your siblings. Marketman in a beatles shirt, shorts and boots. This post, The pictures, MM in a beatles shirt! PRICELESS! Your pix made me smile…at least you can take comfort in knowing that you (hopefully) didn’t put that outfit together! heheh. Your mom looks gorgeous in her picture, so classy indeed. And I love the Teen’s pic! That would make a great cross-stitch project (seriously!) BTW MM, knowing how many “dry runs” of lechon-tasting you had before the NR shoot, it’s a wonder you didn’t balloon to 300 lbs! You looked quite fit in the episode. OH MY GAWD! 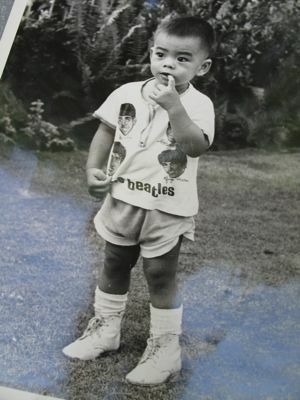 I had that exact same Beatles t-shirt! Who introduced Sister? Don’t tell me it was your niece? hahaha @ dizzy and MM. LOVE the pictures! Your mom was beautiful, you were adorable, and your daughter too precious. All very ‘postura’ with exception of picture #2, though it doesn’t take away from the adorableness. You could say that it was a 2-yr. old’s version of ‘postura’. My grandmother had a similar tamburin (or is it tamburing?) set. The pieces were handed down to her daughters, then her granddaughters. My niece got the necklace, I got the earrings, and a cousin got the bracelet. It’s not worth much money, but it holds a lot of memories. Hahahaha….Love your boots!!!! Did you have it bronze for prosperity? oops….i meant to say posterity!! your little girl I mean teen is so adorable! very very very very Cute! with the capital C! lol! dizzy, lyna, i nearly died laughing with your comments! Cute outfit MM! Your mom look so gorgeous with her terno love it! What a hilarious story! I can imagine how Sister must’ve felt — I’m the eldest of four, and yes, I used to often “ask” (though it was really “tell” or even “command”) my youngest brother to turn the fan on or off, tell the maid something, etc. This incident was really the ultimate revenge! I’m curious — who was the person who called you “pig man?” Someone from the NR crew, a Pinoy who watched the show, or just someone who knows all about the Bourdain visit here? beautiful photos :) i especially like the teen’s pic. so precious! love the fashion sense of “the teen”! hahaha….longjohns as sleeves, and in the Hall of Justice, at that! that is sooo hilarious. i bet the guard thought nothing at all about it..so long as she got her sleeves! Ay postura.. sure made me miss my mom, my aunts and grandma. I hated being asked to turn around so they can check the way I looked – duh. MM, I can say your taste in shirts have improved, considering what you’ve worn in the NR show – I wonder what they’d think if you showed up wearing that Beatles outfit. PIG man? I’d say it stands for Pretty Incredible Guy. That is a lovely photo of your daughter! Another great post MM. I’m laughing like crazy! And your mention of CRISPA t-shirt brought back a lot of memories from more than 30 years ago. Are they still in business? I’ll never be able to live this down or go to an Eyeball where folks will find out I am so ordinary… being “postura” now requires serious effort when it once was SOP. I have to say I am proud to be “Pig Man’s Sister”. Someday I may just run into AB in NYC and heap blame on NR. But being the oldest I had rank but no clout, highly unusual for a Philippine family where hierarchy usually counts. Marketman may have been the youngest, but he was also the most favoured by the stars in the long run, in a family that makes “crazy” a very mild pejorative word. If we wrote a book no one would believe all that has happened in our lives, and it would definitely outclass anybody else’s tale of woe. But a highly developed sense of the absurd has made it all all very funny and memorable. I absolutely agree – Filipinos like dressing up. I wouldn’t be caught dead in sneakers or sweats running errands – I might run into someone I know! This I learned early on from grandma and my mom. Millet, I have the same experience. Before I gave birth, my grandmother’s sister, bought me something to wear for when visitors start arriving. Mom was brushing my hair, had to make sure I had at least powdered my face and put gloss on. I absolutely agree – Filipinos like dressing up. I wouldn’t be caught dead in sneakers or sweats running errands – I might run into someone I know! This I learned early on from grandma and my mom. Millet, I have the same experience. Before I gave birth, my grandmother’s sister, bought me something to wear for when visitors start arriving. Mom was brushing my hair, had to make sure I had at least powdered my face and put gloss on. Oh and by the way, Mom would also have your “face” on for visitors. That picture of you with the boots–I wonder if they made you wear double socks because your boots were too big? Hence the massive thighs & calves? haha. Having missed all the eyeballs, I was delighted to finally see the face behind one of my favorite blogs. Thank you for sharing your pictures and hilarious “revenge” story. How does it feel with the veil of anonymity finally removed ? Thanks for sharing these little tidbits & photos of your family life. Perhaps instead of saying “my brother is Pigman”, you should say, “Anthony Bourdain says my brother makes the best roast pig ever”. Haha. Remember, coming from an unapologetic omnivore that Tony is, that’s one heck of a compliment. Absolutely hilarious MM, thanks for sharing. Love the teen picture! MM, could you please share some pictures of Sister? I have always been in awe of Sister. And, Sister, could you please share some stories about MM? I would like to remain anonymous, unlike Pig Man who has given you a full frontal view, albeit with clothes on. Hello Marketman, was hovering and landed upon your site. What a magnificent find. Iâ€™m so liking and enjoying these and ohâ€¦ I watched ABâ€™s NR PI (10:00 and again 11:00 pm, 2/16) had no idea it was you. Is this find â€œserendipityâ€? â€œLuckâ€? Tell me. Cherry dahlin’ please go fly a kite. I wonder if the ladies in your family inherited your mother’s beauty. “Postura” must be a culture-bound concept, perhaps closely related to “bearing” in English, but not used as extensively in that culture (except for “military bearing” of our cadet days); the closest word in Spanish I can think of is “presencia”. Neither word seems to be the same as “postura”. It seems to require a more subtle effect than the other 2 concepts. Interesting! I grew up unaware of such a concept. was your a mom a moviestar back in the day? coz she looked like one! she’s beutiful…. PigMan just looooves to show off, fer sur! I can relate as I myself is a bunso. one thing that I always miss though is during Christmas I receive the most no. of toys being the youngest and of course a favorite of the lola’s & auntie. oh and one more thing remember for every gathering you have to make Mano to everyone wah it feels like and endless routine. Shall we now call you Pigman?!?!? This post is so refreshing–pictures of kids are always the best. Congrats for NR–haven’t seen it yet but am sure you did one heck of a job! What’s great about your foodblog is it’s never boring…there’s drama, suspense & now…comedy! Your mom has a classic beauty…she’s illuminating! My mom also is a believer in postura. She never goes out of the house unkempt. It is always made up and blow-dried hair. If the clothes have been sitting in her closet for awhile, she will ask the house-help to iron it again. Ayaw nya kasi ng may kusot sa damit. Baka akalain wala kaming plantsa sa bahay :) I haven’t gotten the genes from my mom who by the way is such a clothes horse. I am the jeans/shirt kind of girl for daily wear. Though when the occasions call for it, I dress appropriately–with a lot of effort! 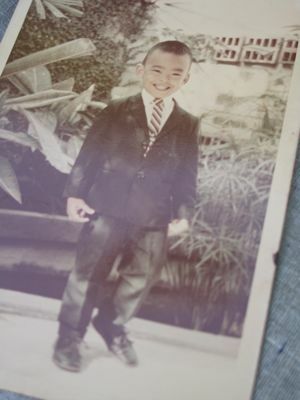 Love the cutie photo when you were a toddler. Guess we are all the same at that age—walang pakialam sa fashion ;) Pero bumawi ka sa third photo—-impressive!! :) the last photo was great—-silent stillness! the teen is such a beauty even at a young age! OMG, I can so relate! I’m the bunso, too, and I was the living, breathing TV remote control. My sister would nudge me w/ her foot to change the channel, that was the remote. Hahaha! Love the beatles shirt, I was reminded of those beatles peanut butter cookies you could get for 10 cents at the neighborhood sari-sari store. Love the pic of The Teen as The Toddler. Beautiful pic. Very often we feel frustrated, as when AB asked about food and by extension culture, and do not have a ready answer. Sometimes culture is easier explained by monuments like the Colosseum for the Romans so that even a dead civilization like the Incas are defined by Macchu Picchu. Unfortunately for us, we have not yet reached a stage of development or of empire [a comment inspired by Karl Marx in his remaining achievement as philosopher of history(Schumpeter, 1942)] where we can claim evidences of culture like McDonalds and Coca Cola, the Apollo program or .45 caliber pistol and the M-1 battle tank for modern America. This ‘stage of development’ concept is important because we often accept false premises like Filipino as ‘damaged culture’ (Fallows, 1987) when in fact culture cannot be superior or damaged but is just is [the set of shared attitudes, values, goals, and practices that characterizes an institution, organization or group (Wikipedia)]; a descriptive set – that cannot be value-judged. I bring up this high-fallutin’ paragraph because of something very Filipino I observed from this MM entry. In times of stress like fear, happiness or pain (the true Cebuano will shout Aguy! instead of Aray! when struck by a big stone in Manila), we viscerally revert to type. So MM, the leader of this community, invites us to his family to share his personal success and we, like true Filipinos would, merrily jump in. Note that Sister and Brother affirmed it. Brother even seems to agree that Sister’s pic should be posted – the one when she was 18 ought to be ok – even after she demures. Like the wooden spoon and fork, don’t you agree that the family albums on the sala coffee table is likewise very Filipino? Family relations as expression of culture is very powerful. While the Vietnamese do not have similar monuments as the Plain of Jars of Laos or Angkor Wat of Kampuchea, they managed to defeat four superpowers – China Tang (938), China Yuan (1255-1285), French (1954) and America (1975) with family. Ho Chi Minh successfully used the extended family concept of Vietnam as one family to defeat the French and later the Americans (Duiker, 2000). And bringing in Mom is something we share with our distant relatives from Borneo. Some of our ancestors probably first crossed the land bridges during the mini Ice Age 18,000 years ago (Tarling ed., 1992) and kept contact by balangay boats after the sea rose. At present day, some Bornean communities still practice Matriarchy where, hear these guys, inheritances are through the mother line and men are given away to the wive’s family. Even after a millennium of Islam, the ascendancy of Megawati Sukarnoputri was accepted in Indonesia. And even after 400 years of latin machismo overlay with the Spaniards, we were among the first in Asia to grant women suffrage and to have lady Senators and now (2) Presidents. I do not think many would disagree that, in our experience, Mom was very often the real power behind Dad in the family. Finally, one reason we get confused when someone – like AB with his western perspective – asks questions on culture is precisely because we are half Western and half Eastern in education and socialization. Our Western half accepts that the categorizing question (from Western deductive deductive mind set) is the legitimate one and are thus stumped for an answer. We should learn from our Eastern half that the question is not the relevant one. As the emptiness also defines the half full glass of water, the one that we cannot describe is there (which two concrete manifestations above), both the categorization and the complementary non-categorization describes us. We think so we are; and move on. P.S. If interested, I can post the references above in Google search key words and/or APA standard. Mandy, They still sell bed jackets in very ritzy shops-check out Sweitzer linen, Bra Smyth, or Bergdorf Goodman.Probably none at Victoria’s Secret. They are great not only for new Moms but for the chronically ill or malingerers who like to read in bed. Such beautiful photos…I like the second one best. teen looks so cute. hi MM. my friend introduced me to your site and now i’m a big fan of yours. we have a few things in common. my dad was also a lawyer and my mom was a professional homemaker (with 9 children) who also did a lot of sewing and other crafts, but was awesome in the kitchen. i have a long saga about her cooking, but i can share that with you some other time. i also have a photo of my mom dressed in a similar outfit as your mom in the photo you shared; both our moms were posturiosa and very pretty. MM — why don’t you publish a cookbook? Put all the recipes you have posted from the beginning and separate them into categories for easy reference. I’ll give them away for Christmas! I can totally relate, Marketman! I am the youngest in a family of seven children. Even worse, I came so late in the day because my mom got pregnant with me when she was 43 (an embarrassing occurrence back in the days, hehehe)! so, I was the ultimate utusan of my brothers and sisters who came before me. But, I studied and made a little something of myself over the years. Now, my brothers and sisters all come to the bunso for help of all sorts. Come to think of it…i’m still the ultimate utusan after all. first time i see a comment from brother. Please excuse redundancy, did not have sufficient time to read preceeding comments. We used posturiosa for sartorially aware individuals. The first name that comes to mind when I hear Balenciaga is Ramon Valera, one of the pioneers of Philippine couture when it was just starting to be dominated by his gender who incidentally, was an apprentice to a grandaunt who was a custorera. Is THAT really Apicio? He is back! New lesson learned: do not go to the grocery or run errands in sweats anymore! thank you, mr.mm for giving us a glimpse of your intimate, though sometimes wacky family moments. love the pictures, love the fashion, love the retro… looks like even as a young kid you have your own style na – “fashionista” na. more than the fashion, its poise and style, and it runs in your family… just look at the kid! but man oh man… will the title “pigman” stick forever? but knowing the story behind it, it would be an honor to be identified as the maker of the best pig ever! kudos again, mr.mm and to the family. so proud to be a part of this blog community! Your mother looks quite the lady. Your daughter’s picture is so lovely, it has a lot of movement, it’s just awesome. Her pose, the way she has her head turned towards the ocean breeze gently blowing at her skirt, just beautiful. It’s one of those pictures that you hope to get but rarely catch right. was about to say “Apicio would have loved this”…and he really does, he’s back! welcome back, apicio! I do not think our mother would want to be known as “Pig Man’s Mom”, definitely not appropriate to the “posturaness” of her being. linen as beach wear? wow– that is style. the teen’s photo is a treasure. Hope to see “brother” more often on the posts…first time here….now we’re dying to meet the entire family of “pigman” hahaha…. the photos in the post are so lovely! Going back a bit in the archives, I seem to have missed a most exciting patch of the blog and definitely everyone. I am now deep in the interior fleeing the madness of carnaval where they say “nao tem mares, tem bares” no beaches, only bars, so MM is half right though the intoxicant of choice here is the caipirinha chasing salt cod cocletas. Oi, Apicio!! as you can see, you were missed…go easy on the cachaca..ate breve! I think, as far as family hierarchy goes, the 2nd born are more independent and free. What is World Cafe Asia? Is it a program showing also in US? Would love another MM shot. MM, you should read AB’s most recent blog. Hats off to Anthony Bourdain, good man with a good heart! Maria Clara, tamburing jewelry is still being made in Meycuayan ,Bulacan. I do not have the address.If I find the business card, I will post it here for you. I have aged gracefully, thank you, without cosmetic assistance. what a hilariously wonderful blog entry! i watched the phil visit of no reservations, that lechon looked de-li-ciou!!! congrats for having anthony bourdain over! Here is Manang’s revenge. Some one asked for a story about Pigman re “bunso”. At one point all of us were at the same school, I was in high school and marketman has just started kindergarten. He asked Mom one dinnertime if she would come a little earlier to pick him up so she could see “Show and tell” time. Next day our mother, properly postura in heels and dress, made up, with appropriate acessories, went to school, tardy as usual. “Everyone is waiting for you”. He triumphantly says to his teacher “I can do my show and tell now” leading our mother to the center of the circle. “Mom” he said, “Show everyone how you can take off your hair and your teeth!”. Uhuh, that is a true story about Pigman. Oh, that is so funny Sister!